T-shirts and apparel in San Diego, California since 1996. 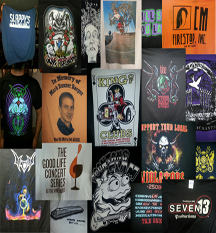 It doesn't matter if you need 5000 shirts for your clothing company, 100 shirts for your business or 50 shirts for your band, Seven 13 Productions can provide you with Quality goods at competitive prices. Specializing in Custom T-Shirt and Apparel Screen Printing, all silk screening is done In-House. We have the ability to do multiple spot or index colors and 4 color or simulated process on light or dark garments. 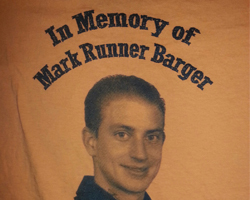 Memorial shirt for Mark Barger does in a one color grayscale on an orange shirt. These type shirts can be done on light or dark shirts giving a great look without using alot of colors. This Mark Almera designed graphic for The Creepy Creeps band, this is a 3 color plastisol print on a black shirt made to simulate the look of an old black velvet painting. Be sure to check out our gallery section and customer link pages for examples of the products we have supplied for them!